When I was at PAX East this year I had the chance to catch up with Square Enix to check out Dragon Quest XI: Echoes of an Elusive Age, and I learned a very interesting fact. Did you know that the last major North American console release of a mainline Dragon Quest game was way back in 2005 with Dragon Quest VIII? I know, that fact blew me away, but looking at the history the other titles were released on handhelds or skipped North America entirely. There were a few spinoff games that came out, but a numbered Dragon Quest game has not come out in North America for over 13 years. The team at Square Enix are very aware of this fact and are trying to make this release special and one that stands out from everyone’s perceptions of a Dragon Quest title. What I saw convinces me they just may have created something that feels enough like Dragon Quest to be familiar but different enough to attract a larger audience. 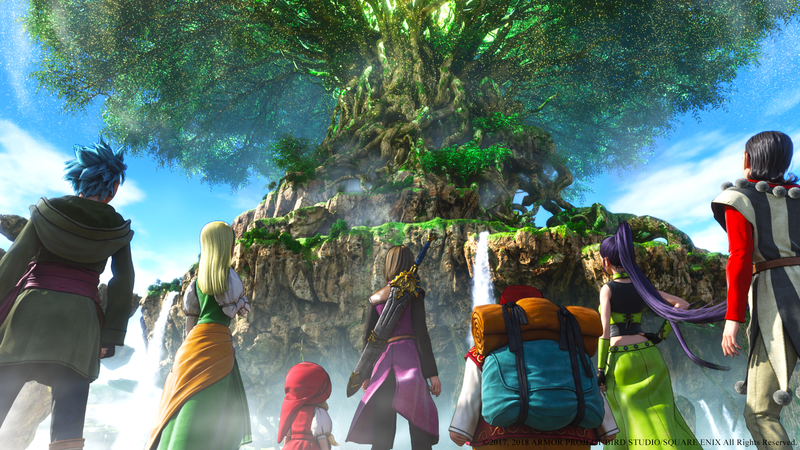 The goal of the team was to create a truly new experience in the Dragon Quest universe that focused on a huge single player experience. They also wanted to deliver a complete experience day one so there will be no post release DLC; the adventure on release day is the vision of the developer. They also wanted to deliver a more mature experience by designing the characters in a more photo realistic meets cel shaded manner. The end result from what I saw in the demo is a game that feels like a grown up Dragon Quest adventure which is exactly what the developer had in mind. The story in Dragon Quest XI: Echoes of an Elusive Age focuses on a young man who is hailed as the legendary Luminary. He faces his destiny and travels to the capital joined by an old friend to see what he can do to realize his destiny. Once there the story takes a huge u-turn and our hero is betrayed by the king and his adventure starts in earnest. Like other Dragon Quest titles many companions will be met and join the Luminary on the adventure to stop the resurrection of the Dark One. The developer has said that relationships with the many companions will be complex and extremely rewarding. As the story progresses your companions will have their own motivations for joining the quest and may not be what they seem. The roster we were shown seems quite interesting with a wide variety of companions to enrich the experience as the story progresses. One of the things I found very interesting was the mature tone of the game which I typically did not associate with Dragon Quest. Gameplay has come a long way since 2005 with many modern touches to the classic JRPG formula being added to this release. Combat is turn based but very fast and the character can move around freely during combat (but that does not affect the actions). Wandering monsters are all skipable as they are visible on the field and can be avoided, but if combat is chosen striking them first gives an advantage. There is also a great horse mechanic (horses area available from the start) that allows the horse to ram monsters as you ride. This gets rid of monsters (within a certain level of you) but nets no experience. The combat is aided by skills and abilities unlocked via a grid system. This system allows each character to choose what skills to prioritize as they progress in levels. This customization has some shared and unique traits between all the characters. The main character has some additional choices unique to him to explore. This customization will enable some great variety in the combat as specific roles are selected. The main quest is fairly linear from what I saw at the demo, but the world has an open structure and there are literally dozens of sidequests to keep the adventure dynamic. The themes of the story are far more mature than previous entries, but I noticed some specific Dragon Quest humor sprinkled through the narrative. What interested me right away was the depth of voice acting in the game which is greatly expanded from the Japanese release – which had mostly text dialogue. Other additions to the North American release are a very welcome dash function for quicker overland movement, enhanced menus and UI as well as a new harder Draconian mode. The dash is something I could instantly see as a huge advantage and the improved UI adds a much higher quality experience to the entire system and experience. Overall, the game is truly stunning as well with amazing visuals, especially the open spaces and landscapes. I have to confess I have only peripherally dabbled in the Dragon Quest games in the past due to the kooky and often kid like nature of the characters and themes. From what I saw in the extended demo at PAX East, this game really tries to break the mold and get more of a mainstream North American audience interested. There are still some concerns in my head – such as some annoying characters and some legacy gameplay that may get repetitive – but I am keen to see more before I make final judgement. Dragon Quest XI: Echoes of an Elusive Age is coming out as a very rare simultaneous release on PC and PS4 on September 4th.